The Geratol Net » Blog Archive » GNEC What is it ? What is GNEC you say ? It’s an awesome tool for keeping track of your progress toward completing several awards, such as the Board, Gold Board, Platinum and Net 500 awards to name a few. The program was created and developed by our Chairman, W0FP – Frosty. I never did ask Frosty what GNEC stands for, but perhaps he can reply to this POST and let us know. My guess would be “GERATOL Net Endorsement Compilation” ha ha Maybe someone else can take a guess as well. The program must be used in conjunction with WinEqf logging software. You need to log your QSO’s made on the net, or in Extra Class SSB portion of 80M into WinEqf to have the GNEC program functional. Both WinEqf and GNEC are available as downloads off the GERATOL Website. 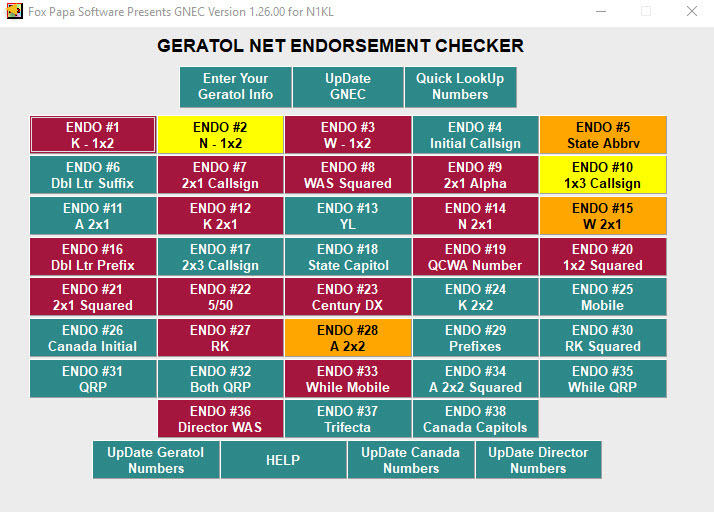 In addition to tracking award progress, you may use GNEC for keeping tabs on your progress toward completing the 38 challenging Endorsements offered by the net. Below is a screen shot of a typical GNEC “Front Page” which gives you a glimpse of the Endorsements completed in RED. The Endorsements in ORANGE mean that only ONE appropriate contact is needed for completing that particular Endorsement, and the YELLOW reflects the need that TWO more appropriate contacts are necessary. GREEN buttons reflect multiple appropriate QSO’s are needed for completion. 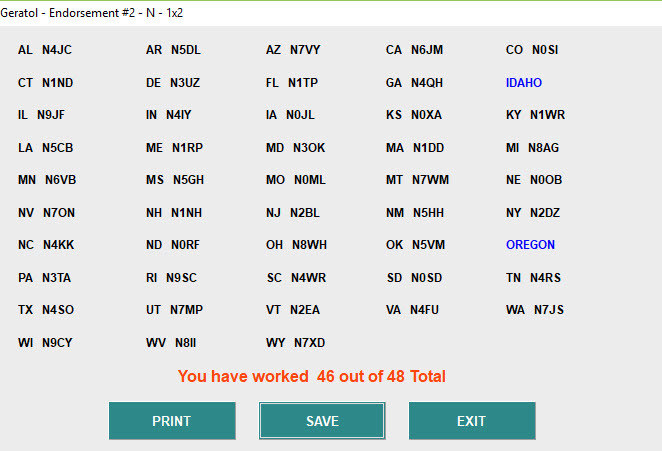 As is obvious, this operator needs to work two more stations with “N” 1×2 call signs, one from Idaho and one from Oregon to complete this Endorsement. Another nice feature of GNEC is the ability to print out these various reports, so you know exactly which call signs you need, as they check in every evening. While there are numerous other great features associated with GNEC, two I will mention are at the bottom of the Front Page. Those are the “Update GERATOL Numbers” button and the “Update Director Numbers” button. Hitting those gives you a running total of the numbers you have worked, and more importantly, those you still need. If you have not already done so, give GNEC a try. It’s a fun and very effective way to track your Award and Endorsement progress on the GERATOL net. Of course, you may find both the GNEC program, and WinEqf available on the tool bar at the top of the GERATOL home page. Simply go to “Files” then “Additional Aids and Forms for the GERATOL Net” Once you click on that, the files may be found and downloaded off that page. Good luck.